New demands – Digitalization not only questions companies’ business models but also puts demand on a fundamentally different approach to project execution. Digital experience transformations require multiple skill sets, from project management and process modelling to disruptive technology and user experience design. Clients can seldom manage all these skills without external parties. However, many digital transformations fail to deliver expected value because they fail to bring all involved parties and capabilities together in a clear and structured project approach. This article aims to provide advice on how parties involved in digital experience transformations can establish a more successful collaboration. The client typically drives the overall direction and prioritization of work, approves changes in project scope, and resolves escalated issues. The key role of a management consulting firm is to ensure progress and structure of overall project delivery and advice client on business strategy and vision. The technology firm enables efficient technical delivery, provides technical expertise and has the overall responsibility for technical delivery. The creative agency provides creative input and inspiration for the development work through prototyping and conceptualization. All these parties need to work in close collaboration to ensure a successful transformation. Continuous collaboration between involved parties – Ensure that all parties are aligned and collaborate to achieve a close-knit output. 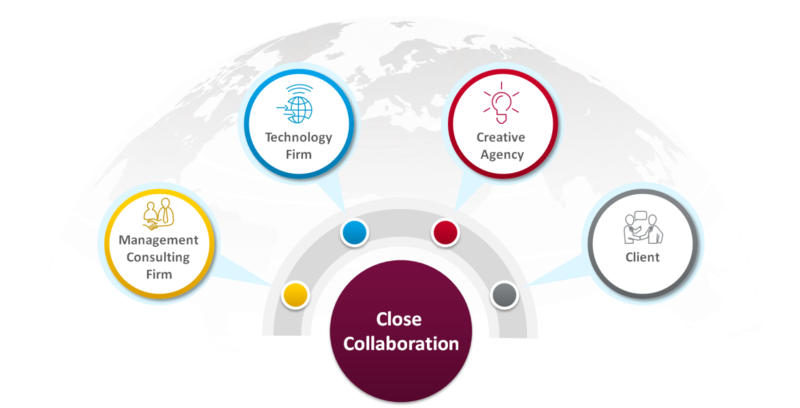 Collaboration is the foundation for success in digital experience transformations. Regular meetings, such as starting everyday aligning on achievements, next steps, and potential issues are a prerequisite. Even relocation of all parties to a separate project office is recommended to ensure daily alignment and a delivery fulfilling required level of technical dept, ease of implementation, business value, and creative edge. However, close collaboration can also obstruct efficiency. Close and regular alignment must be balanced with a clear approach to governance and communication to avoid too much disturbance for involved parties. Clear roles and responsibilities – Address contribution of all parties, define organizational structure, and create awareness of contribution. Ensuring accountability by making roles and responsibilities part of the team’s daily ways of working. Organizational charts and RACIs are typical project management tools to communicate defined roles and responsibilities. However, these tools may be perceived as inflexible and limiting the free role that digital creators demand. Therefore, it’s recommended to focus instead on clarifying the ways of working and on setting the foundation in order to obtain the team’s accountability for the delivery. Awareness of cultural and personal differences – Identify and embrace differences to create stronger teams and better relationships. Different work environments attract and require different personalities. As different capabilities and skill sets are required for digital experience transformations, people will have different background and work habits. Lack of understanding of personality nuances can create frustrations and lead to lower productivity. Creative people are typically innovators with grand ideas. They also have a talent to see the details being neglected by others. However, they can be seen as both slow and unrealistic by other parties. Management consultants are typically tasked with ensuring progress and encouraging the team to overcome obstacles, but they need to strike a balance in order to avoid being seen as too decisive and driving. By bringing disparate personalities together and embracing differences, better relationships and stronger teams are created, improving sharing of expertise and quality of delivery. Participation of full team in early phases – Do not rush the brief and debrief process. Make sure the full team is involved at an early stage for full commitment to the task ahead. The brief and debrief are the most important parts of any creative work, hence these processes should not be rushed. A typical pitfall is to include only the management team in the initial phases. Involve the full team in an early stage to avoid lost or misinterpreted information and delegate the mandate to take decisions to ensure commitment. Put effort in to agreeing on expectations – Clarify expectations in terms of time, quality and costs. Expectation is a classic pitfall. Time, quality, and cost are obvious factors to secure success. All parties involved in the transformation need to understand which elements to prioritize and take the three factors into consideration. Time will always affect the cost and quality and is a key factor in digital transformations since business needs naturally are tied to deadlines. The client needs to clarify deadlines and, based on cost limitations, set resource limitation to ensure that time and quality can be maintained. The quality of delivery also needs to be followed up continuously to ensure that business needs are not neglected. The key is to set high-level directives and guidelines with clear deadlines while leaving the details to the creators. This will ensure a committed team and subsequently improve the quality of the delivery. Responding to new demands. The execution digital experience transformations will always be challenging due to the high demands but, by following the key success factors, a foundation for collaboration is achieved. This will increase likelihood for success and a transformation fulfilling expected business value.